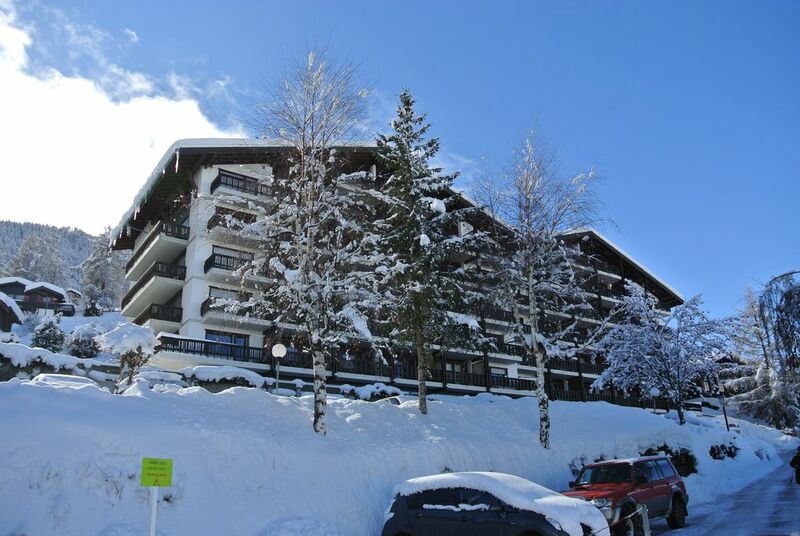 The nice apartment is in a typical traditional Swiss "building-chalet" (6 floors), situated on the ground floor and next to the ski lift Maximum 7 persons. Nice view from the living room on the mountains and valley. There is a nice garden accessible through the double bedroom. The garden is sunny from mid-February. It is extremely pleasant to have breakfast or lunch or a sun-bath on the terrace. It is also possible to ski up to the apartment depending on the level of snow during the winter. There is nice warm swimming poll (free) in the building and also a sauna (payable). There are a lot of ski guns on the sloops. Lots of activities and sport facilities (tennis, golf (sion), walking, mountain bike, outdoor swimming pool, climbing, soker, archery, ..... Sion is the capital of Valais and has a nice fortress and monastar. Ideal for family. one with a bath, toilet and a sink. the other with a toilet, a bath and a sink. Eden Roc is located high up 5 min from the cable car. When you arrive by public transport (post bus) you go off at the last stop (Telecabin) and continue the road until sign-posted Eden Roc. With heavy luggage I would strongly recommend to take a taxi for the short distance as it’s quite uphill. The house entrance is 1 level (16 steps) above the car park. But once in the building you can take the 1st lift on the right from ground floor to go up to the 1st floor. The flat was clean, nice, warm and welcoming. There was a large living room containing a dining table with 3 chairs and a corner bench. A sofa made out of 2 or even 3 individual mattresses to be used for sleeping. 2 Armchairs, a coffee table and a carpet. There was also a large TV/Video set but the DVD player had a UK plug for which there was no adaptor provided. The basic kitchen was in a separate small room with electric (not ceramic) hob, oven, under-worktop fridge with the top shelf a freezer compartment, microwave, water kettle, coffee machine etc. The master bedroom had a double bed frame with 2 single mattresses, the 2nd bedroom had a single youth bed and a bunk bed but without a safety rail for the top one. Both bedrooms were quite small but had plenty of hanging space and some shelves but neither had a key to lock. There were 2 tastefully tiled bathrooms, 1 with toilet, sink and bath and the other with toilet, sink and shower. There was a nice balcony at the front, where we ate dinner on most days. But unfortunately a newly erected 5 story building opposite was obscuring some of the beautiful view onto the mountains. At the back there was a small private garden with an old PVC deckchair and 2 old wood/material deckchairs for sunbathing leading to a large but very steep grass area where you could climb over to access the road without going through the staircase (take care in wet whether!). The entrance hall and staircase were well lit with sensor operated lightings. The building is managed by caretaker who lives on site but only speaks French but the flat is looked after by a local lady who never made contact with us. I can also confirm that the owner promptly acknowledged receipt of payment (by bank transfer) and sent all the required info for the flat. In summary; I would highly recommend 34 Eden Roc for a nice and pleasant holiday. Super situation près des pistes et du centre,,dans un immeuble très calme..... très bonnes prestations. Versleten inboedel. Ingezakte sofa. Oude beddelakens met gaten. Vieze vloerbekleding in slaapkamers. Inboedel van appartement is aan vernieuwing toe. Bedankt voor je feedback die lager is dan die ik normaal ontvang. De slaapbank in de woonkamer is inderdaad versleten en wordt eind april 2019 vervangen (bestelling wordt uitgevoerd). Wat betreft uw andere opmerkingen, mijn appartement is niet modern maar comfortabel, goed uitgerust en functioneel. De dekbedden en meubels (behalve de keuken en matrassen van de grote kamer die vorig jaar werden vervangen) zijn niet nieuw, maar nog steeds functioneel en in de traditionele stijl zoals op de foto's te zien is. De bekleding van de kamers was niet vies toen ik daar vorige week was. We had an excellent stay in the apartment which is located in the Eden Roc building. The gondola/ski bus station as well as shops and restaurants are just a few steps away. The apartment is spacious, has two bathrooms (shower & tub) and a well-equipped kitchen. The large swimming pool was a great plus! Thanks. It was a pleasure dealing with you. Nous avons passé un très agréable séjour durant une semaine au mois de Juillet 2010 avec un appartement 3 pièces,spacieux bien exposé (2 terrasses), proposant le confort absolu. Piscine intérieure propre peu fréquentée, parking au pied de la résidence...Lieu paisible et magnifique... Nous n'avons jamais trouvé de telles prestations en France! La qualité des informations donnée par le propriétaire est très fiable. Pour les européens, la devise (franc suisse) est à échanger à la douane (sans frais). Pour tout cela, nous recommandons cette location! At around 15 kms from Sion, the capital of the Valais. 90 minutes by car from Geneva airport. Pour les draps et essuies, il y a un supplément de Euro 20 par personne. Il faut me spécifier si vous en avez besoin afin de les préparer. Si vous souhaitez utiliser le lave linge, il faut également me prévenir à l'avance (carte pré-payée à prévoir). Le coût par linge est de chf 4.